NOAA has reopened 4,281 square miles of Gulf waters off western Louisiana to commercial and recreational fishing. The reopening was announced after consultation with FDA and under a re-opening protocol agreed to by NOAA, the FDA, and the Gulf states. On July 18, NOAA data showed no oil in the area. Light sheen was observed on July 29, but none since. Trajectory models show the area is at a low risk for future exposure to oil, and fish caught in the area and tested by NOAA experts have shown no signs of contamination. Between July 26 and July 29, NOAA sampled the area for both shrimp and finfish, including mackerel and snapper. Sensory analyses of 41 samples and chemical analyses of 125 specimens that were composited into 14 samples followed the methodology and procedures in the re-opening protocol, with sensory analysis finding no detectable oil or dispersant odors or flavors, and results of chemical analysis well below the levels of concern. At its closest point, the area to be reopened is about 185 miles west of the Deepwater/BP wellhead. The entire area is heavily fished by fishermen targeting reef fish, menhaden and shrimp. NOAA will continue to take samples for testing from the newly re-opened area, and the agency has also implemented dockside sampling to test fish caught throughout the Gulf by commercial fishermen. To view the fact sheet released today on the administration-wide effort to ensure Gulf seafood safety, click here. Fishing closures remain the first line of defense to prevent contaminated seafood from entering the marketplace. NOAA continues to work closely with the U.S. Food and Drug Administration and the Gulf states to ensure seafood safety. NOAA and FDA are working together on broad-scale seafood sampling that includes sampling seafood from inside and outside the closure area, as well as dockside and market-based sampling. The closed area now covers 48,114 square miles, or about 20 percent of the federal waters in the Gulf, which was 37 percent at its height. On July 22, NOAA reopened 26,388 square miles of Gulf waters off of the Florida Peninsula, and on August 10 opened 5,144 square miles off the Florida Panhandle. NOAA will continue to evaluate the need for fisheries closures and will re-open closed areas as appropriate. The Coast Guard does not advocate cell phones as a substitute for the regular maritime radio distress and safety systems recognized by the Federal Communications Commission and the International Radio Regulations — particularly VHF maritime radio. However, cell phones can have a place on board as an added measure of safety. Cell phones generally cannot provide ship to ship safety communications or communications with rescue vessels. If you make a distress call on a cell phone, only the one party you call will be able to hear you. Most cell phones are designed for a land-based service. Their coverage offshore is limited, and may change without notice. Most everyone has experienced communications out to about 25 miles at times. Yet at other times they could not get through to a land based phone inside of 10 miles from shore. This might well create a communications problem in the event of an emergency at sea. Locating a cell caller is hard to do. If you don’t know precisely where you are, the Coast Guard will have difficulty finding your location on the water. Cell phones do provide the convenience of simple, easy-to-use, inexpensive, private and generally reliable telephone service to home, office, automobile or other locations. Placing a shore-to-ship call to someone with a cell telephone is especially convenient. However, you usually cannot use your cell phone outside the United States, and you may need a special agreement with your carrier to use it outside that carrier’s local service area. VHF marine radios were designed with safety in mind. If you are in distress, calls can be received not only by the Coast Guard but by ships which may be in position to give immediate assistance. A VHF marine radio also helps ensure that storm warnings and other urgent marine information broadcasts are received. 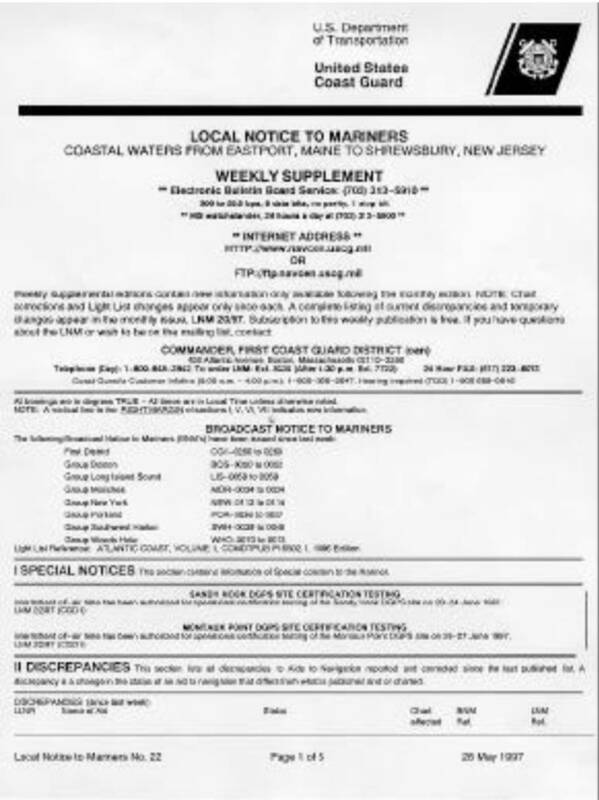 The Coast Guard announces these broadcasts on VHF channel 16. Timely receipt of such information may save your life. Additionally, your VHF marine radio can be used anywhere in the United States or around the world. On VHF radios, however, conversations are not private and individual boats cannot be assigned a personal phone number. If you are expecting a call, channel 16 or the marine operator’s working channel must be continually monitored. SHOULD YOU RELY ON A CELL PHONE EXCLUSIVELY? Actually there is no comparison between cell phones and VHF marine radio. They normally provide different services. The cell phone is best used for what it is, an on-board telephone — a link with shore-based telephones. A VHF marine radio is intended for communication with other ships or marine installations — and a powerful ally in time of emergency. If you have a cell telephone, by all means take it aboard. If you are boating very far off shore, a cell phone is no substitute for a VHF radio. But, if you are within cell range, it may provide an additional means of communication. A recent survey revealed that 64 percent of boaters are not concerned enough about the accuracy of their navigational aids to seek out or make updates, according the Alliance for Safe Navigation, which released the results from a survey of 7,570 recreational boaters. The alliance is composed of several boating industry companies that joined forces last spring to promote the importance of up-to-date navigational information. The group, which is sponsored by the National Oceanic and Atmospheric Administration, consists of BoatU.S., Jeppesen, the United States Power Squadrons, OceanGrafix and the Sea Tow Foundation for Boating Safety and Education. The survey was intended to measure the use and awareness of available updates to navigational tools. It revealed a general lack of concern among recreational boaters regarding the accuracy of their navigational data. While most boaters use aids such as GPS, electronic charts and paper charts, 79 percent fail to track updates issued weekly by the United States Coast Guard that maintain the accuracy of their navigational aids. These updates, called Local Notice to Mariners, contain information about changes such as shifting shoals, moving buoys and newly submerged obstructions and can be easily accessed by boaters. Just go to the link above and click on the area you plan on boating in to read the latest USCG Notice to Mariners for your location. 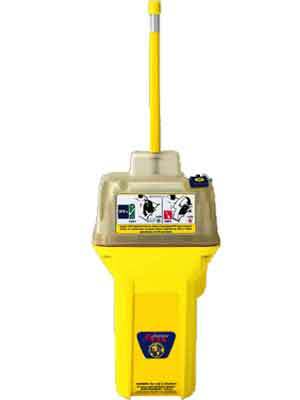 Stick to manufacturer sanctioned service, or your Emergency Position Indicating Radio Beacon (EPIRB) could stop working. The Coast Guard reported that one of its districts has received at least three reports regarding unapproved replacements of 406 MHz EPIRB batteries by servicing companies that have no association with the EPIRB manufacturer. These unauthorized battery installations would likely result in a failure of this critical item of lifesaving equipment, and as such are not in compliance with the operational readiness requirements of 46 CFR, the Coast Guard stated. The Coast Guard reported that every approved (i.e., accepted by the FCC) EPIRB is tested during its approval process using batteries specified by the manufacturer. Approved EPIRB’s come with a user’s manual, which describes battery maintenance and replacement procedures. In order for the EPIRB to remain within the conditions of its approval, the manufacturer’s instructions in the user’s manual must be adhered to. To ensure that replacement batteries are of the same type with which the EPIRB was approved, and are correctly installed, manufacturers typically specify that battery replacements be done only by the manufacturer or a manufacturer approved shop. Any modification or changes to an EPIRB must be made in accordance with the manufacturer. The use of alternative replacement parts or batteries is prohibited and may prevent the device from meeting lifesaving requirements, the Coast Guard stated. Accordmg to the Coast Guard, EPIRB owners and servicing facilities must be aware of the potential for equipment failure stemming from any EPIRB modification or unauthorized battery replacement. STUART, Fla. — A Florida judge has ruled that a doctor violated navigational rules during a 2009 boating accident that severed a scuba diver’s legs. A Martin County Judge sentenced the emergency room doctor last Wednesday to six months probation on a misdemeanor charge. The diver from Palm Beach Gardens was struck by the doctor’s boat propellers while diving in January 2009 about 4 miles north of the St. Lucie Inlet. The diver testified that he had the proper “Diver Down” flag displayed and further tried to warn the approaching boat by waving a spear gun above his head on the surface, but no one acknowledged his signal. He said he tried to swim out of the way of the boat, but its propeller struck his tank and legs. So what do we take away from this horrible news report? You may run across boats engaged in diving operations almost anywhere, so keep a sharp lookout and scan the water ahead of you. If you spot either or both of these flags, keep well clear (at least 100 to 200 feet depending upon state law) from the vessel and diver down flag, if floating. Also watch carefully for bubbles breaking the surface. It could indicate that a diver has strayed from the area and may not be near the dive boat. In Florida where this accident took place, the law requires display of a divers-down flag anytime someone is diving or snorkeling. The size of a divers-down flag displayed on vessels must be 20 inches by 24 inches, and a stiffener is required to keep the flag unfurled. Dive flags carried on floats may still be 12 by 12. Also, dive flags on vessels must be displayed at a high point on the vessel so that the flag’s visibility is not obstructed. Divers must make reasonable efforts to stay within 300 feet of a divers-down flag on open waters (all waterways other than rivers, inlets, or navigation channels) and within 100 feet of a flag within rivers, inlets, or navigation channels. Vessel operators must make a reasonable effort to maintain a distance of at least 300 feet from divers-down flags on open waters and at least 100 feet from flags on rivers, inlets, or navigation channels. Vessels approaching divers-down flags closer than 300 feet in open water and 100 feet in rivers, inlets, and navigation channels must slow to idle speed . Divers shall not, except in case of emergency, display the divers-down flag in an area which would constitute a navigational hazard. You should research the laws of the State in which you are diving or operating around divers for the specifics of flags required and the operating distances from those flags. 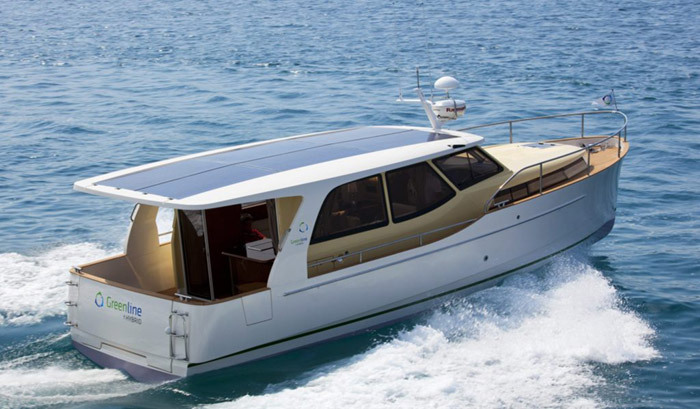 The “Greenline 33 Hybrid” is the world’s first production hybrid (diesel-electric) and solar powered boat. Designed by Seaway, its causing a new wave of emissions-free boating in Europe. A super-displacement hull allows it to move at higher speeds with less energy while operating on its’ hybrid system. With the flip of a switch, it moves between electric and diesel drive. Cruising slow at speeds of 4-5 knots, the Greenline can drive in electric mode for 20 miles on a 240 Ah 7 kW lithium battery. A this speed, the solar roof can produce the same amount of energy that the boat consumes, we now have perpetual boating. Top speed is set at 10 knots, it utilizes a VW Marine TDI 75-4 diesel engine, which also allows the generator to charge up the batteries. The solar roof, equipped with 6 standard photovoltaic solar panels protected by a 3.2 mm glass shield, provides electricity for driving and to power appliances inside the boat. With a day of sunlight, the panels can produce up to 2 kW of electric power and recharge the batteries to 80%. 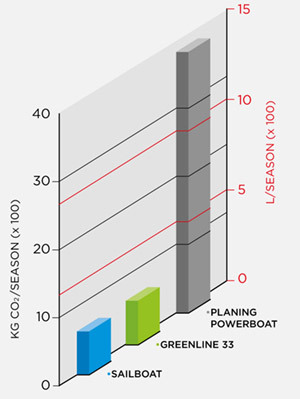 A comparison of fuel consumption by Seaway Group Slovenia (makers of the new boat) show that the Greenline 33 is on par with a 33 foot sailboats for the amount of diesel and CO2 emission in kg used per boating season. This $300,000 USD hybrid is completely emission-free when in electric mode, and will burn on average 4 times less fossil fuels per nautical mile than comparable planing hulls. Next time you cruise into a marina’s port, with the Greenline 33 you’ll be coming in without smoke, noise, and wake. Something no other powerboat can claim. ANNAPOLIS, Md., August 12, 2010 – On the afternoon of July 25th, a fast moving storm packing 70 mph winds, rain and lighting swept across the Chesapeake Bay. Over the next two hours, US Coast Guard Sector Baltimore, MD, received 37 calls from mariners in distress. Unfortunately many boaters and anglers, unaware of the supercell’s fury, were caught unprepared. But it didn’t have to be this way. The review, which covered satellite and phone-based weather services for the coastal inshore and inland boater, included free cellular phone text messaging services to fee-based subscription services that display weather information on a chartplotter. Each weather service includes hardware, such as a standard flip phone, smart phone, computer or chartplotter, as well as the software designed to present the information. Foundation staff limited their focus to the actual content and depth of weather information provided. This included the ability to deliver local, land-based weather information (current conditions such as temperature, wind or barometric readings), hazardous weather warnings, radar imagery, land and marine forecasts, and NOAA buoy reports. To view the full report and details on each pick’s features, Foundation Findings #49 – Weather to Go, go to BoatUS.com/foundation/Findings/49.